Looking for cutting edge interesting future tech on the Solider Modernisation horizon, and one never needs to look much further than the US Defense Advanced Research Projects Agency (DARPA). Legged Squad Support System (LS3). Photo: © Darpa. Latest news out of DARPA says they may be very close to neuro-driven human machine interface that would allow fire-control and other mission critical operations to take place at the speed of thought. Dr. Arati Prabhakar, current director of DARPA, said during a brief at the Defense One Summit in Washington, DC in November, that the signal from a human brain could conceivably “control a Virginia-class submarine instead of needing to input controls through touchscreens, knobs, or dials.” She added that this area of research is moving steadily towards the possibility of obtaining a “very sophisticated level of control” of complex mechanical systems via a neural interface. To put the concept in focus, Prabhakar continued in her presentation to explain how neuroscience advancements are already demonstrating prosthetic limbs that can be controlled by the mind of the wearers, via connections to the prosthetic through small implants in the brain. To scope the best route, the robot uses a suite of sensors, including laser radar. 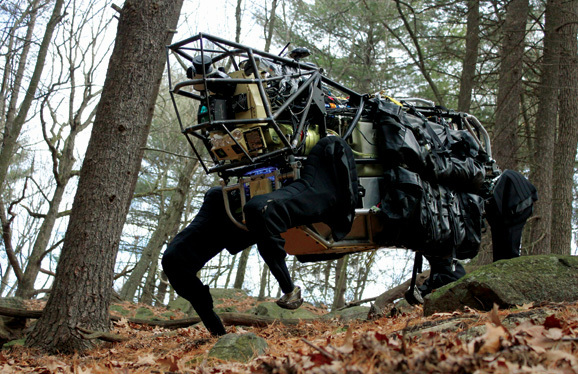 The obedient robo-mule can also play “follow-the-leader” by using stereoscopic cameras to fix on a Marine’s location and trace the path he’s taken by following a navigation device strapped to his boot. DARPA says, in addition, technologies that will allow squad members to speak commands to the LS3 are anticipated to be added during this testing phase of the project. Believe it or not, marines still use a lot of horsepower, and mule power in war zones. Tracked and wheeled vehicles just can’t go where dismounted Marines often have to—legs are needed to traverse rocks, steep inclines, woods, and swamps, and right now the Corps relies on horses and actual mules for that purpose. The LS3 is envisioned to do the same job, without the need to be fed, quartered, and trained. There are kinks that still need to be worked out though; the LS3 is loud and the engine exhaust very hot, problems that will have to be worked out before this mule is available for the long haul.